Hydrogravimetry is an emergent method to map and monitor active areas within the Critical Zone. It consists in measuring spatial and time-variable gravitational changes, which are sensitive to the amount of water stored within the Critical Zone and therefore water concentration in specific areas (flow paths of water). Combining different types of gravimeters in synergy with classical hydrological tools allows a thorough investigation of storage parameters and storage-flux relationships from non-destructive surface measurements at spatial scales 1-100 m. These instruments are either permanent, semi-permanent or portable gravimeters (hybrid approach). 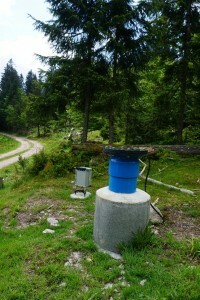 The novelty of this multi-instrument gravimetric experiment based on precise and time-stable instruments is to bring new results on the time-evolution of aquifers by coupling gravity measurements with other geodetic, geophysical, hydrological or hydro-meteorological types of observations. 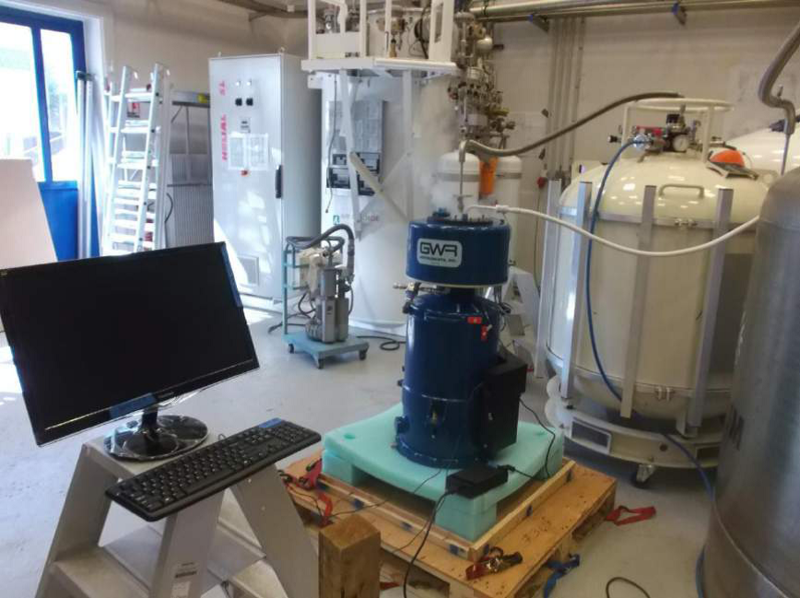 In the frame of the CRITEX project three portable superconducting gravimeters iGrav (GWR Instruments, USA) have been acquired. These superconducting gravimeters are nanotechnology instruments (detection of signals as small as 10-12 g, where g is the mean surface gravity). 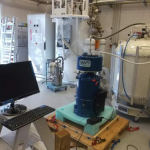 They are the most precise instruments available (precision equivalence to 2 mm of a water thickness change) and sufficiently stable to investigate seasonal water balance closure and even the impact of climate on critical zone storage. 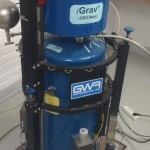 In addition to the iGravs CRITEX also purchased a portable spring gravimeter Scintrex CG5-M to allow by regular loop repetition of gravity more insight on the spatial distribution of the water storage. 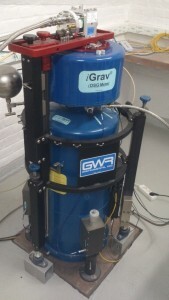 One of the three GWR Instruments Inc. iGrav superconducting gravimeters installed in the Strasbourg Gravimetric Observatory for a test period in 2016. 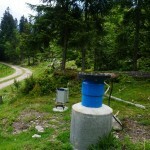 The portable spring gravimeter Scintrex CG5-M measuring gravity close to a borehole on the Strengbach watershed in the Vosges. The state variable of tomorrow ? 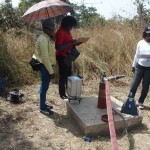 Gravimeters provide an integrative estimation of the water storage. High frequency gravimetric estimation could become the new state variable to characterise a specific hydrological system in a similar way as flow discharge plays this role today. IGrav superconducting gravimeter (during a liquid helium filling and installed on a pillar at the Strasbourg Gravimetric Observatory). Hector, B., Séguis, L., Hinderer, J., Cohard, J.-M., Wubda, M., Descloitres, M., Benarrosh, N., & Boy, J.-P., 2015. Water storage changes as a marker for baseflow generation process in a tropical humid basement catchment: insights from hybrid gravimetry, Water Resour. Res., 51, doi:10.1002/2014WR015773. Hinderer, J., Crossley, D., & Warburton, R., 2015. Superconducting gravimetry, in Treatise on Geophysics, vol. 3 Geodesy, second edition, vol. ed. T. Herring, ed. in chief G. Schubert, Elsevier, Amsterdam, The Netherlands, 66-122. Pfeffer, J., Champollion, C., Favreau, G., Cappelaere, B., Hinderer, J., Boucher, M., Nazoumou, Y., Oï, M., Mouyen, M., Henri, C., Le Moigne, N., Deroussi, S., Demarty, J., Boulain, N., Benarrosh, N., and Robert, O., 2013. Evaluating surface and subsurface water storage variations at small time and space scales from relative gravity measurements in semiarid Niger, Water Resour. Res., 49, doi:10.1002/wrcr.20235.